Asparagus is easy enough to cook. But then again, there are some blind spots when it comes to actually cooking it. If you’re not familiar in handling this vegetable, better take a look at the things you should do and what you should avoid doing. 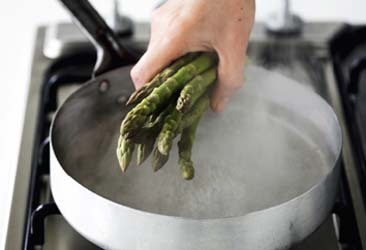 When steaming asparagus, better tie all the spears together in one bundle. Ten to twelve stalks per bundle should do. Why? This would enable you to take them out of the pot or steamer all at the same time. It is better not to serve asparagus cold. Spears that have been refrigerated will have a dull, lifeless flavour. Serve them warm or at room temperature instead. Thinking of grilling asparagus spears? When you shop for stalks, do not choose those thick ones even if they may seem nice to look at. Thick asparagus stalks are hard to grill because they burn on the outside even before the insides get cooked. If you have already bought thick stalks for grilling, blanch them first for a minute or two before grilling. When easier asparagus grilling, it would be easier to skewer five to six spears together. Make sure to leave enough space between each stalk. This way, they would be easier to turn while cooked. Taking them out of the grill will also be a effortless. Are you going to cook asparagus that has been stored in the fridge too long? Limp spears are still salvageable. How? Simply trim the ends of each stalk and put them in a glass filled with two inches of cold water. Cover the glass with a plastic bag and place in the fridge for an hour. You should see your asparagus come back to life after that.